With over 50 years in the pneumatic systems business, Kice puts a priority on the engineering and construction of Kice Industrial Fans. Our fans serve industries where they must run around the clock, continually delivering high performance under tough conditions. Kice Fans operate in plants where downtime is unacceptable and plant efficiency is critical. It was with this in mind that Kice developed and has refined its line of industrial fans which offer exceptional value and longevity to its customers around the world. 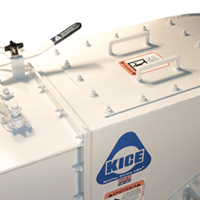 Kice Fans are designed specifically for applications such as pneumatic conveying, dust control and air stabilization. While Kice Fans continue to evolve to meet customer needs, certain advantages remain constant. Heavy-duty, sanitary, food grade construction, custom fan design, total systems design, after sale service and parts inventory are priorities with everything Kice builds. Many companies build fans. Many engineers apply them. Few companies have the experience and ability to combine these functions and truly serve their customers’ needs. Kice believes that designing air systems is as much an art as it is a science. Text books and professors can provide a strong foundation. Experience in the field has taught Kice how to handle each special set of circumstances properly, accurately and efficiently. Three standard bases are available on Kice Fans. The Arrangement 9FB is a slightly less expensive base that is capable of handling motors up to 40hp. For motors 50hp and large, the Arrangement 9F is the base of choice. 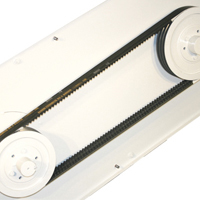 Both have motor rails for easy belt tensioning and sanitary, heavy-duty welded construction. Kice also offers an Arrangement 4 base which is a direct drive assembly. Kice FC Fans, are the work horses of Kice’s fan line. 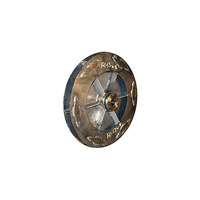 The straight radial blade fan wheels in Kice FC Fans are suitable for air streams with heavy dust loads. A variety of fan wheel options also allow Kice FC Fans to handle heavy product loads when the application requires them to. Kice FC Fans are general service fans that provide maximum versatility and reliability. 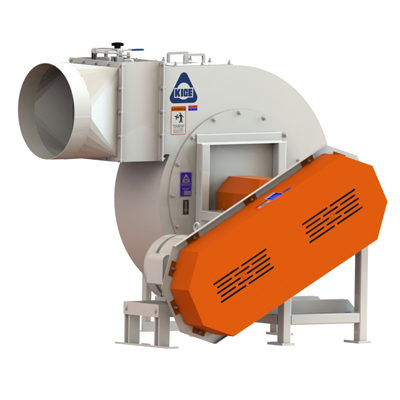 Kice FC Fans handle air volumes up to 50,000CFM with static pressures up to 20”wc. Kice FCW Fans have the same features as the Kice FC Fans but are designed with narrow width blades that can operate at higher speeds and higher static pressures. Kice FCW Fans are designed for negative pressure pneumatic conveying systems. 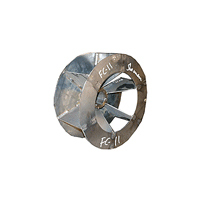 Each FCW Fan is specifically engineered to satisfy each application’s set of requirements. This customized approach provides customers with highly efficient solutions to their complicated pneumatic conveying needs. Kice FA Fans feature an airfoil (sometimes called backward inclined) fan wheel that is designed to handle dust free air streams. 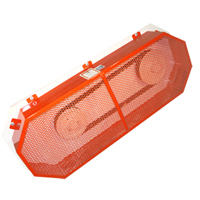 Typically installed on the clean air side of a baghouse filter, FA Fans are more efficient and quieter that other fan designs. The FA Fan is a non-overloading fan in terms of horsepower. It should only be used in clean air applications. Sanitary Bases are standard on Kice Fans. Upon close inspection, one will notice the open structure and lack of cracks and crevices on the base. Continuous welds are standard on Kice Fans. This design minimizes surface area for dust build-up and allows easy access for cleaning around the fans. Heavy-Duty Construction starts with square tubing bases rather than sheet metal type bases which are commonly used by other fan manufacturers. Continuous welds throughout also add the rigidity of Kice Fans. Safety Guards are over designed to not only provide more protection to personnel in the area, but are built strong enough to last for the life of the fan without being “beat up”. Mesh type openings are provided for viewing and for sanitation purposes. 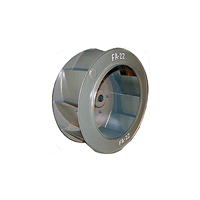 Shaft and Bearing diameters exceed fan industry standards in both size and quality. 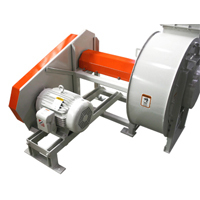 Proper bearings from leading manufacturers are selected for each fan. Fan Drives are heavy duty, off the shelf v-belt drives designed with a minimum 1.5 service factor. 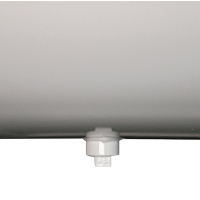 Multi-Louvered Damper provide fine adjustment control in the field. Cleanout Doors provide access to the interior of the housing. Drain Plugs can be useful in outdoor applications. Fan Wheels balanced at Kice prior to shipment is standard. Each wheel is dynamically and kinetically balanced with state-of-the-art equipment. Each Kice Fan is also test run prior to shipment to check any potential motor problems. Materials of Construction include mild steel painted with Kice quality equipment enamel or stainless steel. Other materials and/or coatings are available upon request. Spark Resistant Designs are available for applications where combustible vapors are present. Versatile Orientation is standard on all Kice Fans. The discharge direction can be changed to discharge up, down, horizontal or midway between each direction. 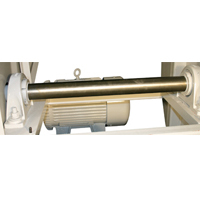 Motors may be mounted left or right of the shaft depending on field requirements. Vibration Isolation Sleeves and Pads protect Kice Fans from vibration surrounding it. They also protect surrounding equipment that may be sensitive to energy being dispersed from the fan. 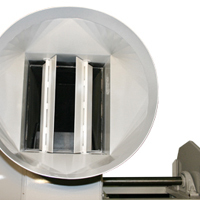 Discharge Weather Shields allow air to exhaust during operation and keep weather out of the fan during downtime.